The Caribbean-like waters of Play Ses Illetes. We can’t have a list of the best beaches in the Balearics without mentioning Playa Ses Illetes. The much-celebrated beach is distinguished by its Caribbean-like waters – crystal clear and pastel blue – which, thanks to its UNESCO protected status, the Playa Ses Illetes stays so pristine. 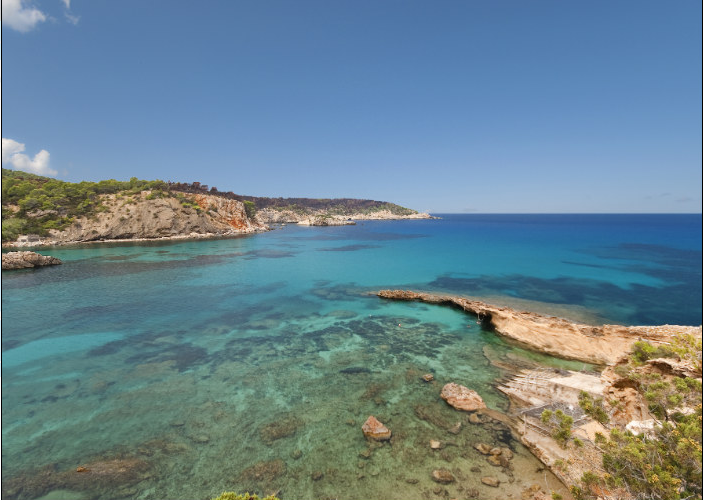 Ses Salines Natural Park is one of the most explored destinations in the Balearics by boaters and yachtsmen, being conveniently located between Ibiza and Formentera. In addition to the more popular, Playa Ses Illetes, you will also find several other amazing beaches on the eastern side of the small island. A hotspot for sun-worshipping and beach-loving yachtsmen around the world, Cala Jondal, on the south-western coast of Ibiza, is one of the best beaches in the Balearics. Cala Jondal is buzzing in the peak summer months so if you are looking for a lively beach while on your yacht charter holiday in Ibiza, this is the place to be. The beach is home to one of the most famous beach clubs in Ibiza: The Blue Marlin. So grab a drink and get ready to party! The Blue Marlin hosts some of the best DJ’s throughout the summer months. Alternatively, enjoy the view of the endless blue sea while sipping champagne and enjoying freshly caught fish at one of the beaches chic beachfront restaurants like the Tropicana Ibiza Beach Club. Arrive in style at Cala Jondal in Ibiza for as little as €133 per day. Motorboats in Cala Mondrago. Photo credit @Carlos Garcia/Flickr. 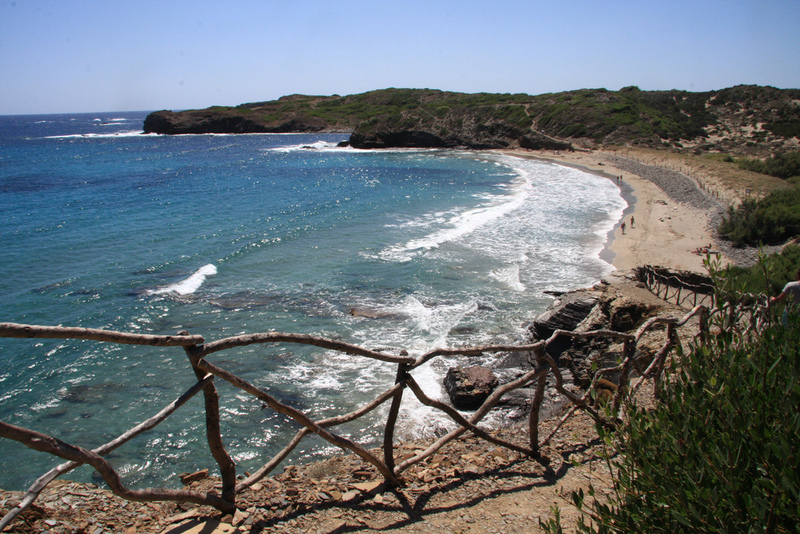 The stunning Natural Park of Mondrago is one of the most impressive beaches in the Balearics. 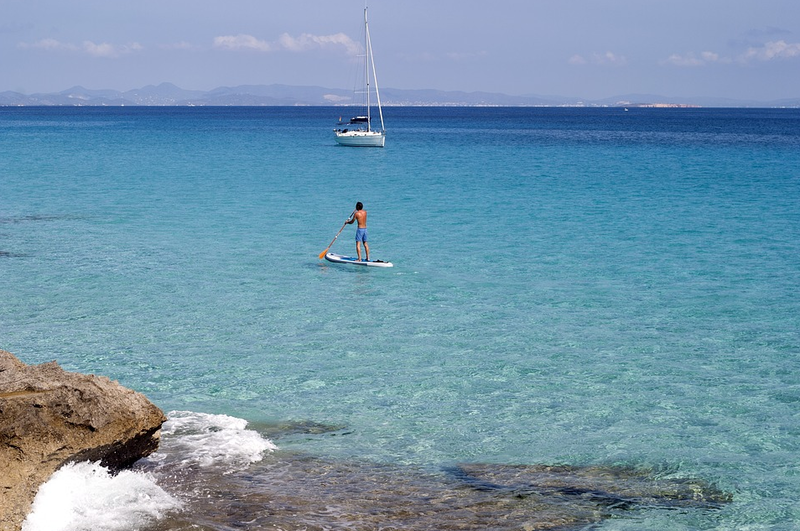 The park is not far from Cala Figuera, a small, charming fishing village located on the south-eastern coast about 60-km from the capital of Palma. Known for its brilliantly blue waters and fine white sand, Mondrago offers a serene escape. The protected park is home to several breeds of birds and interesting botanical species. From the beach, you can go for a walk in one of the shaded trails where you can take in the scents of the wild herbs that grow in the park and enjoy spectacular views of the sea. In the summer, you will find many boats in Cala Mondrago as it is easy to drop anchor on the sandy floor. A day spent on the shores of Mondrago is highly recommended. You can find refreshments at the beach bar or wait for the local fruit salesmen who will cut open a fresh pineapple, watermelon or coconut – yes, it truly is paradise. Visit one of nearly 700 beaches on the island of Menorca on your chartered yacht in the Balearics. Photo credit @maymonides/Flickr. 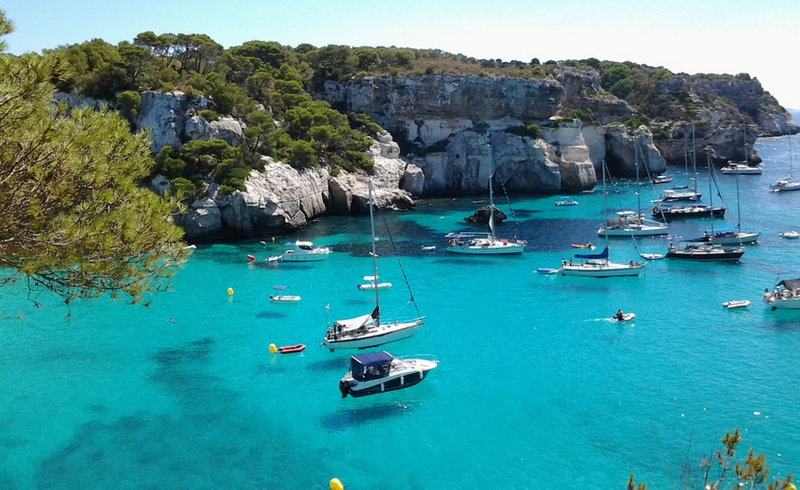 Menorca boasts even more beautiful beaches (in terms of number) than its big sister, Mallorca. 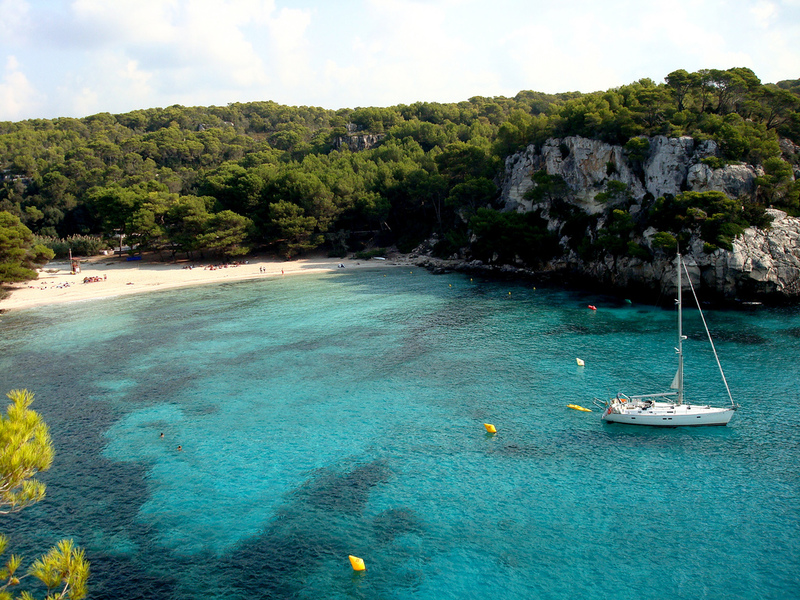 You’ll have an opportunity to discover almost 700 beaches in Menorca, while sailing in the Balearics. 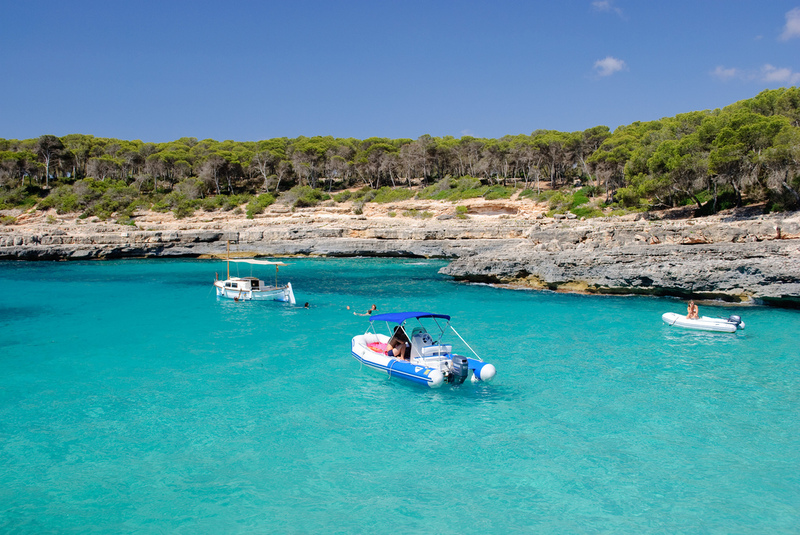 While you really can’t go wrong with any of the beaches in Menorca, we suggest that you take a trip to Cala Macarella. Distinguished by its vibrant turquoise waters and wild landscape, the unique beauty of this cove will make you feel like you’ve been transported to another world. Make sure to bring your shoes ashore to enjoy the wonderful trails around the beach. 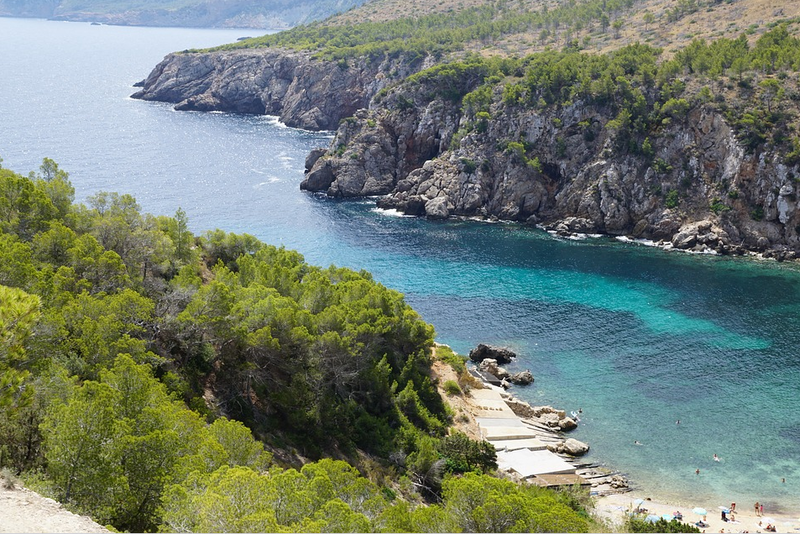 If you are looking for a something a bit quieter and “au naturel”, hop over to the equally beautiful Cala Macarelleta, which is popular among nudists. Enjoy the peace and tranquillity of Cala D’en Serra, a wild and intimate beach, while sailing in Ibiza. To get away from the summer crowds in Ibiza, take a trip to this quieter, more intimate beach of Cala D’en Serra. Upon entering the bay from your chartered yacht, you’ll surely be impressed by the natural beauty that surrounds the cove. The bright blue and emerald waters of Cala D’en Serra contrast wonderfully with the rugged landscape that defines this idyllic corner of Ibiza. Located at the northern tip of the island, Cala D’en Serra should not be missed on your quest for the best beaches in the Balearics. If venturing to Cala D’en Serra by boat, we do recommend to get there early to take one of the few anchorage spots this small, yet wonderful, bay offers. Photo credit @Rodrigo Gómez Sanz/Flickr. 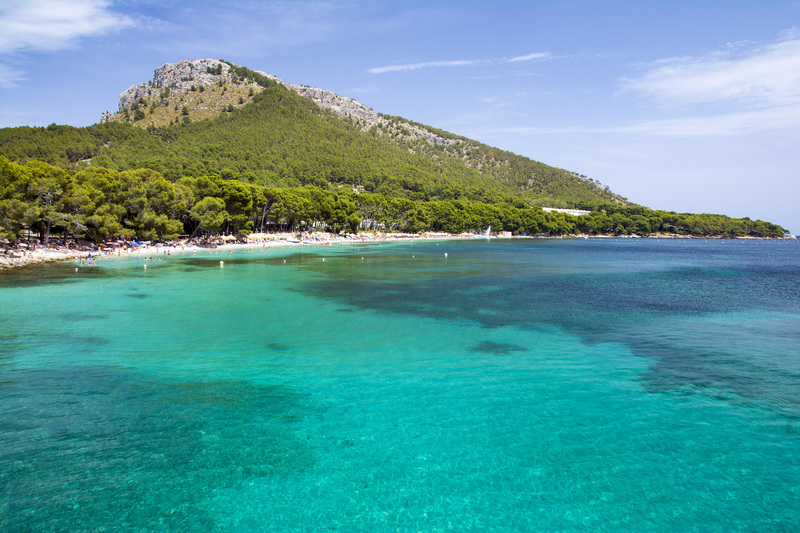 Also on the northern coast, is Formentor Beach, a long, narrow stretch of sandy beach. From your yacht, you can enjoy the best view of the beach, which is lined with pine trees under a fantastic backdrop of towering mountains. This a popular spot for yachtsmen who often frequent the beach for the day while sailing between larger ports. The cool shallow waters and shady spots for lounging make Formentor particularly attractive on a hot summer’s day in the Balearics. The crystal waters also make it a wonderful beach for snorkelling. You can find a few beach bars and shops with small souvenirs should you desire a keepsake to remember your boat holiday in Mallorca. Looking for a calm bay to spend the day on your chartered yacht in Formentera? 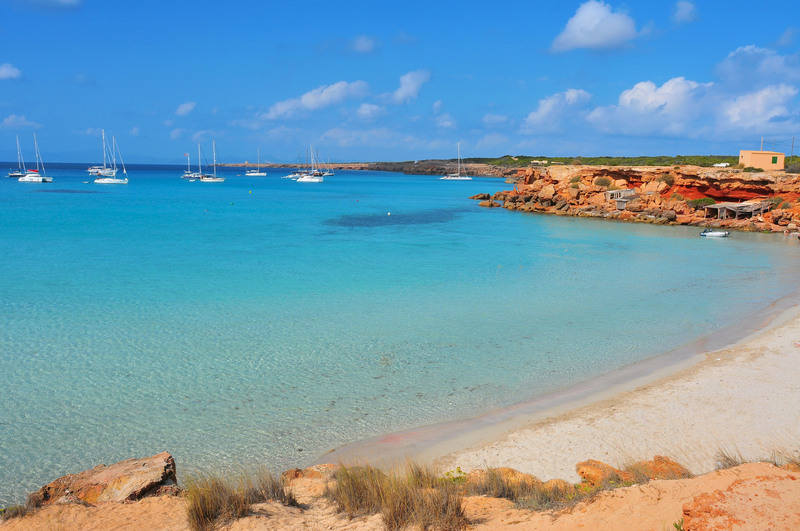 Cala Saona is a stunning oasis set between the rock red cliffs on the western coast of the Formentera. The fine sand and calm waters certainly make this one of the best beaches in the Balearics for boating. Spend the afternoon wading in the shallow waters, playing beach tennis or admiring the underwater views while snorkelling. As the sun begins to set, grab a drink at the characteristic beach bar – the perfect ending to a day spent at Cala Saona beach. A view of Sa Calobra. 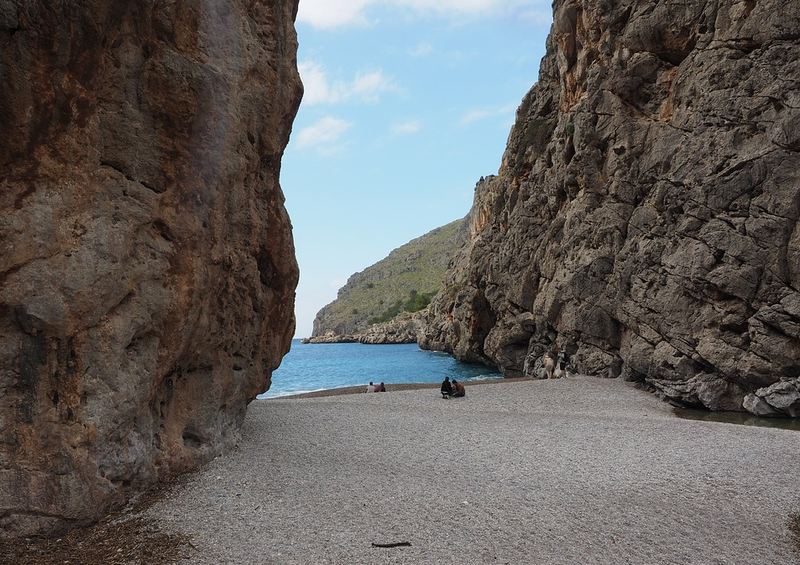 The Torrent de Pareis is one of the most well-known hiking spots in the Balearics. Though it takes some effort, the journey through the canyon and along the steep cliffs will have been well worth it once you make your way to the shore of Sa Calobra. For the lucky ones who chartered a yacht in Mallorca, it’s a pleasant sail along the north-eastern coast of the island to arrive at the famed cliffs of the Torrent de Pareis. The pebble stone beach, famed for its location between two towering cliffs, is a popular place for hikers to enjoy a picnic and is well worth a visit by boat. On the other side of the cliff-lined beach, you will find a beachfront restaurant where you can stop for a drink or meal while sailing along the enchanting northern coast of Mallorca. View of Cala Tortuga. Photo credit @lereile lereile/Flickr. Located in Menorca’s lovely Grau Albufera Natural Park, Cala Tortuga provides that wild, natural beach that you’ve been looking for. As one of the island’s most important protected landscapes, Grau Albufera, on the northern coast, will enchant you with its raw appeal. Take a walk among wildflowers on the trails that surround the multi-coloured sea after a relaxing swim. You can also take a walk to the charming Favaritx lighthouse. The shallow waters are perfect for a family day at the beach, yet keep in mind that there are no facilities on shore. Along with Cala Tortuga, Grau Albufera Natural Park is also home to two other similar beaches: Cala Presili and s’Arenal de Morella. Finally, on our list of the best beaches for boating in the Balearics in 2017 is the small cove of Cala Xuclar on the northern coast of the island of Ibiza. Cala Xuclar embodies the rustic charm you are looking for while on your yacht holiday in Ibiza. Said to be one of the last tranquil refuges on the dynamic island of Ibiza, Cala Xuclar is the perfect place when you feel like escaping the busy world. The beach offers a small bar and some umbrellas and beds to rent, but other than that, Cala Xuclar retains its rustic and natural appeal. Spend a peaceful day snorkelling and lounging in the sun on this little piece of paradise. Want to learn more about sailing around the Balearics? Check out our overview here and get more tips with our sailing guides to Ibiza and Mallorca. 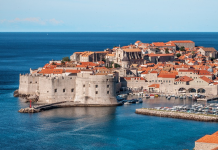 You can also find the latest deals on yacht charters in the Balearics here.